Now, if you have never attended a political convention, you should be aware that there are two main parts. The first is the scheduled executive elections, policy discussion, and constitutional conversations. The second is the party suites that happen after hours. As you can imagine, the real influencing and networking is done at the second part. Although it is painful and extremely difficult, you can (sort of) bring your active toddler to the official and scheduled events during the day. You cannot, however, bring a toddler to a late night suite full of “libated” liberals and libertarians. So more often than not, if mothers do attend at all, they are left out of the part where the real influencing is done. Political parties of all stripes have, at the very least, paid lip service to getting more women involved in politics. The initiatives have had varying levels of success, but mostly have succeeded with women who have fewer responsibilities outside work (a.k.a. do NOT have young children). 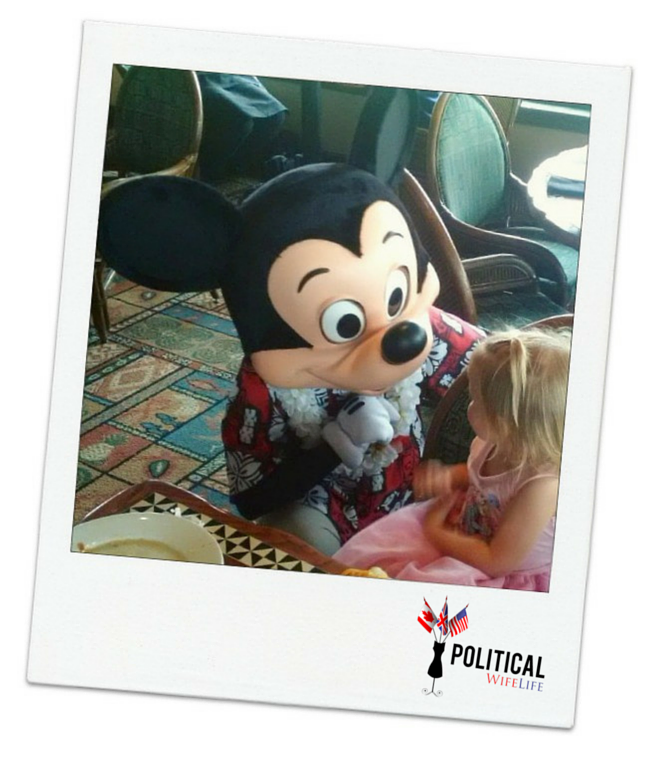 Once you have a child, the usual “woman and politics” barriers move to an entirely new level. Yet, there are some very simple solutions that would make a big difference to women and families getting involved in the political party process. And who better to learn family-friendly ideas from than the mecca of all family destinations: Disney? 1) Child Care: Have it onsite. At Disney they have group child-care available during certain hours for children over the age of three. For those under the age of three or for those who want more flexibility or would like a babysitter to come to their rooms, Disney provides a post card of a third party nanny service. The cost of providing a post card to a third party babysitting company is free – in fact they might even pay YOU. 2) Quiet Spaces: Have a quiet area for moms to breastfeed, pump, or put their feet up. Include a diaper changing station with a garbage container and hand sanitizer. A glass of tap water with ice is priceless if you are tired, thirsty, and growing a person. These gems can be found at all Disney theme parks. These gems cannot be found at political conventions. One woman, a long time party activist, attended this past weekend’s political convention but chose to leave her infant at home. She was not staying on site at the convention and forgot the electrical cord to her breast pump. Where would she pump? The bathroom? Today breast pump power cords aren’t as ubiquitous as Blackberry chargers at political conventions. Let’s work to change that. 3) Have An Area Aimed Towards Children: Have a little area with a diaper changing station and a television (and maybe even a microwave). Go to Costco and buy some water and granola bars. This way all parents (and not just lactating ladies who want some privacy) can rest while their kids take some time away from the hustle and bustle of crowds. Every Disney hotel lobby has a television and little kids’ chairs set up to keep kids happy while the parents check in. You know what sets the tone for a positive weekend? NOT having your toddler have a melt-down while you try to check in. Disney has probably spent a lot of money studying this. Let’s save ourselves the focus groups and just copy their idea. 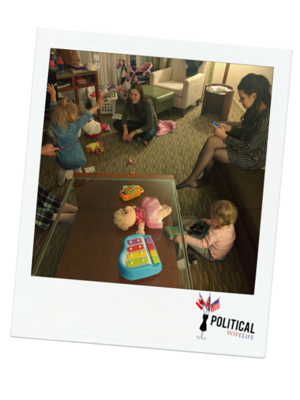 This past weekend, my politically involved mom friends and I did what women throughout time have done to succeed in the workforce: we grouped together and solved our child-care dilemma. We had a big hotel room and hired some amazing babysitters. It took some foresight and planning. There will always be the dedicated political hacks who will drag their aching pregnant bodies and tired toddlers to political conventions. But for everyone who attends there will be many who decide it just isn’t worth the financial and emotional costs to drag your tired child to a political convention just to have your voice heard. Political parties are missing an amazing opportunity to get a target demographic involved and invested. Political parties are also missing out on the many ideas that mothers of young children bring to the policy process. Elections are won by votes and votes are gotten through policies that people identify with as well as through the blood, sweat and tears of volunteers. Mothers are more likely to show up and vote and volunteer if they feel valued and invested in the political process. So please political parties, don’t just call on us on election day. Make it easier for parents to participate in the entire political process. I really enjoyed this post. It was a great conference but there was room to incorporate these suggestions and make it more inclusive. Great thoughts! Thanks Lindsay! It was great to finally meet you at the conference!